Taking a little shade in the heat of the day. Giraffes need our help. Their numbers in the wild are decreasing throughout the world each year. African Giraffes alone, are already listed as an endangered species because their habitat is being encroached upon by civilization cutting down trees to clear the land. Come with me to learn about them and how we can help them to survive. Giraffes only eat leaves from the Acacia, Mimosa and Wild Apricot trees and once those are gone, they must sometimes travel hundreds of miles to find forage. Without the re-planting of these specific trees, giraffes will run out of the only food they need for survival. Is there a way to help? Yes there is. Donate to re-plant the trees in their habitat. You can do that here: African Wildlife Foundation. Their numbers are also being significantly reduced by hunters, some just for sport, some for their meat, skin, tails and tendons. True, the latter items then support the human race, but lump all the numbers together, and the giraffe population is suffering. But there are things we can do to help save them and I’ve provided links for that purpose, and given you a number of book choices to learn about giraffes and how they live. Giraffes have been hunted in Africa for the use of their meat for food and the skin as ornaments, their tails used for bracelets, necklaces and thread. Even the tendons were used for strings of musical instruments. But they began to be hunted for sport in the 19th century, where nothing was used, they were just trophies. 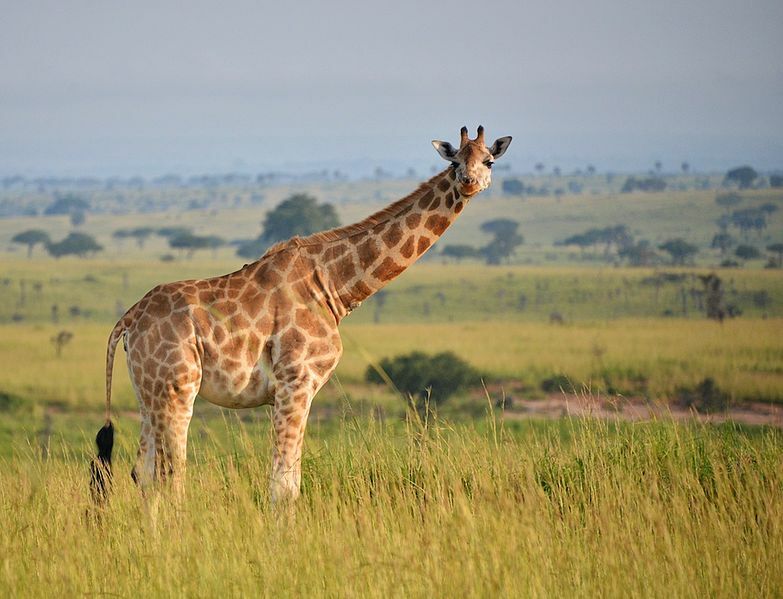 At the same time, the destruction of their living space has increased, since trees are being removed from the landscape to make way for people, thus leaving giraffes no food. Generally, Giraffes are not considered as an endangered species, but they have become eliminated from many areas that were their normal range. In nations where they were normally found in great numbers, they have virtually disappeared. The West African giraffe and the Rothschild giraffe have now been listed as endangered, since their population has been reduced to hundreds. Another species of giraffe, the Nubian, may have less than 250 remaining in the world. Some studies have indicated giraffe numbers are estimated to be as low as 80,000 world wide. Zarafa is the true story of an African Giraffe, written by author Michael Allin. It’s a book that will stay in your heart. These giraffes are at their greatest vulnerability from all predators as they drink water. Fortunately, they do not need to do this often, as their forage usually contains enough moisture to meet their needs. But the most deaths from predators occur at watering holes. 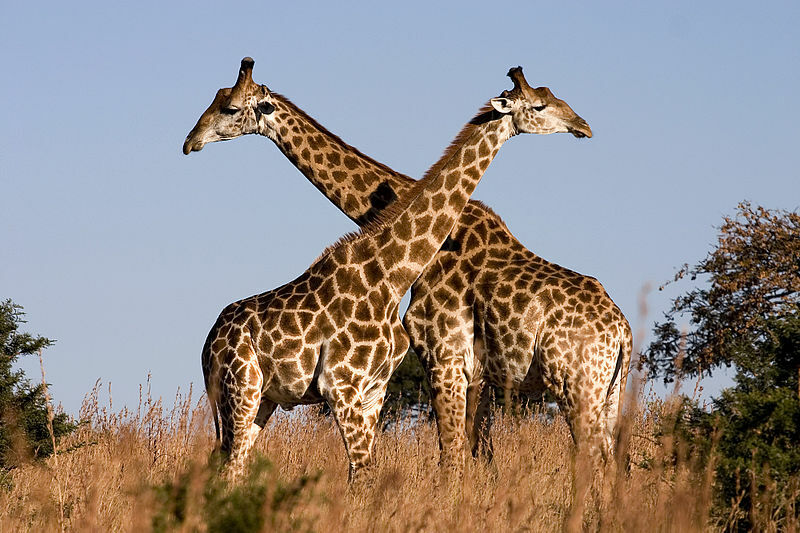 Male giraffes do “battle” with each other for female affections by a maneuver called “necking,” where they wrap their long neck around the opposing giraffe’s neck. Usually the battle is over when one of them has enough and walks away. The giraffe’s closest relative is an okapi, a mammal that looks as though it is related to the zebra because part of its body is striped. Most of the time, if you see a few giraffes, you will also see zebras. Zebras are smart and love to travel with giraffes since they will spot any predatory danger before the zebras get wind of it thereby giving the zebra a better chance of surviving. Giraffes grow from 16 to 20 feet tall. Calves are usually around 6 feet tall when born, and are dropped from the standing mother. The calves are able to recover quickly and are running around within a few hours of birth. WARNING: If you are squeamish about graphic videos, please know that this video shows an actual birth as it occurs, front feet first, then head and the rest of the body and hind legs follow. Giraffes are ruminants, meaning they are much like cows in that they have multiple stomachs and regurgitate a “cud” to continue chewing. Giraffes see the world in full color and their sense of hearing and smell are keen. Contrary to popular belief, giraffes are not silent. Courting males cough loudly, females bellow for their calves, and calves make numerous snorts, bleats and mewing sounds. Sometimes they’ve been known to snort, moan or hiss. Here is one actual recording of some of the sounds Giraffes make. The antenna-like protrusions on a giraffe’s head are known as ossicones, and lie flat on the calf’s head until a few days after it is born. They are ossified cartilage and remain covered with skin and fur, unlike antlers or horns. You can adopt a giraffe or any wildlife species here at this link to the World Wildlife Fund. If you’d prefer to donate to the protection of the giraffe or any other wildlife species, this is the link to do so. The sounds a giraffe is able to make. Yes, there are ways we can help Giraffes: Donate to one of the many wildlife organizations listed on this page, or to the one that replants the trees they eat. After all, they can’t survive without food and those three trees are the largest part of their diet; Acacia, Mimosa, or Wild Apricot. What are your thoughts on these reasons we are losing Giraffes? Do you have other solutions to stop them from going extinct? Please leave your comments about this beautiful, graceful, peaceful animal in the comments. If you love Giraffes, here are lots of things with a Giraffe motif you might like. I have no issue with a wild animal hunted for food to feed the hungry, especially when the rest of the animal is utilized too. However, trophy hunting giraffes and other animals disgusts me. I had no idea that the gorgeous giraffe has become an endangered species. How cruel that the greed and noncaring of some people ends up leading to destruction of nature’s wildlife. Thanks for bringing about awareness of the giraffe’s plight with this article, Nancy.